What would you call a person who, with his single touch, can make you live without food for life? How would you describe a person who can fill a Nirahari with life sustaining energy with the power of his words? We call him Paramahamsa Nithyananda and describe him as the Rare Living Incarnation, Enlightened Master who is more of an unexplainable phenomenon, who is impossible to define. You cannot contain an Ocean, so why bother trying? Each Master of an era introduces updated teachings (dhamma), spiritual community (sanga) as befits a man’s needs during that period in time. Each Incarnation, Enlightened Master introduces a new sampradaya, a new spiritual lineage. Masters happen again and again, proving the ‘impossibilities are I’ M Possibilities’ of human potential by their living example. Who is an Avatar? “When the pure conscious energy means highly matured soul assumes human body, we call them as Incarnations. In Sanskrit we call them as Avataras. Avatar means coming down.” – defines the Avatar, Himself. The Avatar, H.H Paramahamsa Sri Nithyananda’s advent on earth is a happening out of deep compassion for the upliftment of humanity, coupled with the responsibility to enrich every being – never giving-up on them. Endowed with infinite spiritual attributes, ‘Ananta Kalyana Gunas’, introducing THE Master of millions is ineffectual. Just as an ocean cannot be contained in any vessel, nor can its infinite glory be described in words, describing the Master is attempting to limit the limitless. The Master is like an infinite spiritual mall, everyone can find something they best connect with, and raise to the peak experience of human life. He is the reservoir of all auspiciousness in the state of Enlightened Consciousness. Life Solutions to anything that is limiting us from life – physically, emotionally, and spiritually is available in this grand spiritual mall, to enrich us with a space of constant possibility, positivity, leadership, and enlightenment. The science of Nirahara, being without food is one such offering among many from this spiritual mall directly from the founder and Master of Nirahara, Paramahamsa Nithyananda. Nirahara is one of the rarest gifts from the Master. Looking back into the spiritual history, some Masters emphasized on periodic fasting, some stressed on balanced intake. Couple of centuries back man was not plagued by the growing addiction to food, its patterns and its shortage either. Today however, he is bound within the cage of his unhealthy body, depressed mind, and spiritual poverty. Probably the clarion call for solution had tipped the cosmic scales in our favour and that call for help manifested as the Avatar Paramahamsa Nithyananda’s most valuable contribution – in form of Nirahara, thus making man HUNGER-FREE, and ultimately pattern-free leading to a state of completion. When the belly’s hunger abates, so does the hunger for all else. In His words, “Yogis have for centuries lived without food, gaining health, longevity, energy, and higher consciousness. Now it is your time to learn. It is now time to wake-up and authentically LISTEN to the clarion call of the Avatar to begin the ultimate life of a Nirahari – a hunger-free, liberated being, free from the self-imposed cage of body and mind. It is now time to make all our Impossibilities into ‘I ‘M Possible’ with the grace and guidance of H.H. Paramahamsa Sri Nithyananda. Paramahamsa Nithyananda is a global leader in the science of enlightenment. 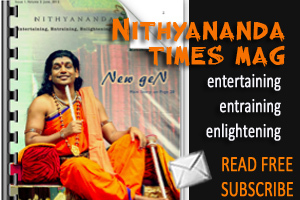 Nithyananda is revered as a living Avatar (divine incarnation) by millions worldwide. He is the most-watched spiritual teacher on YouTube.com with more than 16 million views, and the author of more than 300 books published in 27 global languages. Paramahamsa Nithyananda has been named among the world’s top 100 most spiritually influential personalities of 2012 by renowned esoteric magazine ‘Mind Body Spirit’ from Watkins. And this was even before he introduced Nirahara to the world! A spiritual genius with an Enlightened insight into everything from management to meditation, from relationships to religion, from success to ultimalte life’s success – Sannyas. Paramahamsa Nithyananda brings to us a wealth of practical wisdom, meditation techniques, kriyas and tools for lasting inner transformation. A trained yogi from birth, a powerful spiritual healer, a siddha – perfect being, and the knower and giver of the 8 Great Extrordinary Divine Powers, ‘the Astha Maha Siddhis’, Paramahamsa Nithyananda is working actively with scientists and researchers worldwide to decode the mystical yogic sciences of the East, including levitation, teleportation and manifestation (materialization). The Master is the one who has demystified the science of the impossible, Himself being adept in Ashtamaha Siddhis (the 8 super powers). The Master is the greatest advocate of living with a “Yogic body & Vedic Mind”. Nirahara is His causeless gift for humanity to develop a Yogic body that is a joy to live in and to create a Vedic mind that does not bring suffering and is enriched with the experience of higher truths of living with Integrity, Authenticity, Responsibility, and Enriching. The Master is the one whose advent on the planet is happening to grace humanity with the 4 sacred truths, ‘Catur Veda’, the essence of Truth to be lived by every being. Only when we live with these Tattvas, does our live really start. Only then, LIFE begins to happen in us. Till then, only our root-patterns of limitations, powerlessness, and incompletions with our body-mind, with our very life are living through us. Till then, man is only a possibility, a seed to become a real being, the life-enriching banyan tree. Such is the need to each one of us to live these great Truths. and ENRICHING YOU AND OTHERS (Aapyaayanam). When initiated by the Master into living these 4 truths, one lives a life free from the self-destructing patterns that leave us incomplete and thus, bound. The most practical utility of such a life is that we get the power to manifest OUR REALITY. Paramahamsa Nithyananda says “Use Nirahara to create a space of “POSSIBILITIES” – The possibility of success! Whenever you successfully do something that you thought was utterly impossible, you feel a sense of expansion, a sense of growth and inner strength. Those are the moments when you have given life to your living. If you think living a healthy life without food is impossible, then do a Nirahara program. By the time you finish it successfully, your body will have been trained to understand that it is not just a bio-mechanism, its capabilities evolve to the point of making you experience a “SPACE OF POSSIBILITIES” within you. When this space of pure excitement and inspiration, settles in the level of your bio memory, that is when you experience BLISS. It is life constantly oozing in your muscles. Living in Nirahara, following its practices simply bolts the sense of “constant inspiration & excitement” in our bio memories. This is why we say Nirahara has to be built upon after the Master sows the seed of Nirahara within us. It is up to us to nourish it, to nourish us. That decision is enough – the alchemy happens on its own. The science of Nirahara sources back its origin to the timeless, grandest living tradition on the planet, the Vedic Tradition. The Cosmic Father, Lord Shiva and Cosmic Mother, Devi are the original source of all Vedic Sciences, that are practiced, retained, and enriched to the humanity through their direct disciplic lineage. In the sacred scriptures and great epics of this rich vedic tradition, are contained the crest jewels of extraordinary human history to its peak possibilities. We come to be know about many sages, diving beings, masters, devotees who undertook intense austerities of body, mind. In the recorded history of mankind too, we hear of many Yogis, who live many paths, some seated in meditative postures for years, without the need to eat, sleep, or rest trusting their body’s natural intelligence to live without any wants, and so becoming complete and fulfilled beings. The Science of Nirahara, living beyond the need of hunger and thirst is by far one of the most sacred, subtle, rare practices that was undertaken to purify the self, not only for inner success, but outer expression of leadership. All spiritual practices are living sciences, passed down through the oral tradition, ‘Karana Parampara’ from the Master to their disciples, through initiation only. Mother Parvati herself, undertook intense practices of Nirahara, living just on few Bilwa leaves, and absorbing the Prana directly from air, she realized the source of her infinite energies, Lord Shiva. 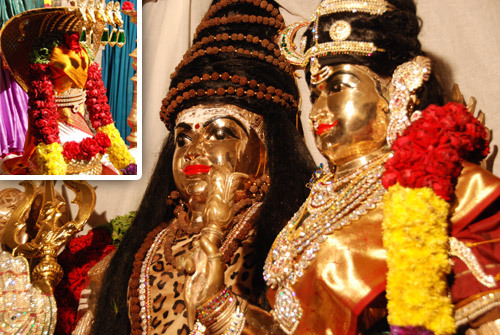 Sharing about the sacred Nithyananda lineage, the Master enriches us with glimpses from the life of great child incarnation – Thiru GnanaSambandar – the founding reviver of the Madurai Aadheenam, the oldest, greatest living spiritual monastery in the world, birthed by the Cosmic Father and Mother, Lord Sundareshwara, Shiva’s incarnation and Devi Meenakshi, the complete incarnation of Devi Parvati. Srila Sri Paramahamsa Nithyananda Sri GnanaSambanda Desika Paramacharya Swamigal is the direct successor of the Madurai Aadheenam lineage, being its 293rd pontiff. Thiru Jnana Sambandar holds an endearing space in Nithyananda lineage being an extraordinary living example of a life-long Nirahari, besides His prodigious incarnate mission. As a small child of 3, he drank the breast milk of Devi, Mother Meenakshi herself. 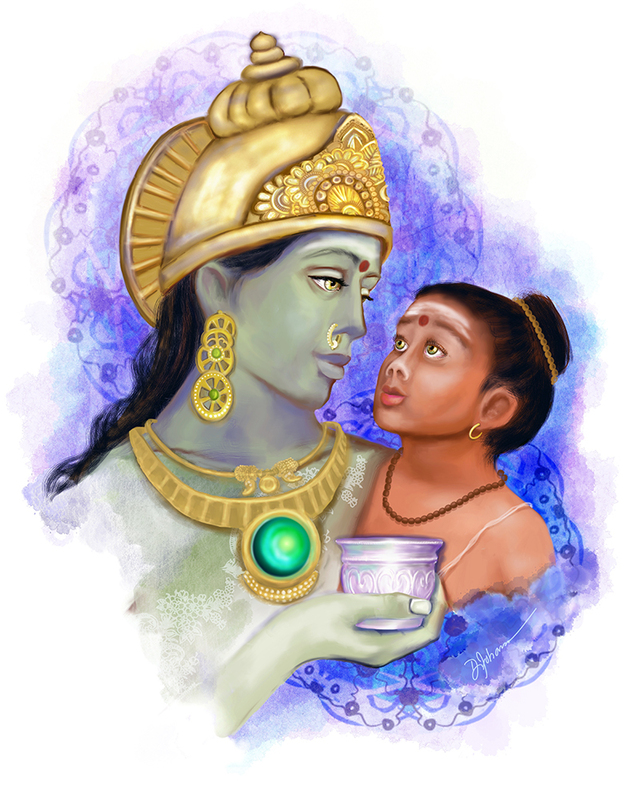 When the Mother poured the milk to him, imbued with the sacred knowledge – the milk of knowledge, the ‘Jnana Paal’, the child Sambandar became enlightened. The spiritual knowledge became an experience for him. On drinking the divine milk, the nectar of enlightenment, Jnana Sambandar became a life-long Nirahari, living and breathing authenticity, with the responsibility to enrich the world with the sacred 5 syllables of ‘Namah Shivaya’. The Master reveals the sacred secret of Jnana Sambandar’s power of living a food pattern-free life as a Nirahari. This Truth reveals its own glory, through the divine Tamil compositions of Thiru Jnana Sambandar for His beloved, Lord Shiva. In over 4000 devotionally nectared spiritual compositions of his ‘Thevarams, in not a single verse, the king of Shaiva Tradition, sings a mention of food in the context of taste, smell, or any food-related experience. In fact His experience of relating with food was – like any other external riches of nature, like trees, birds, earth, its color, and so food. But, not a single context of food as ‘an experience for the body’. The Master has revealed the important Truth of a Nirahari’s life through this – anyone composing over thousands of spiritual truths through poetry naturally cannot keep his own life experiences, his own cognition hidden. The real personality, the vizualization, and the inner space of that person is revealed to the authentic listener. 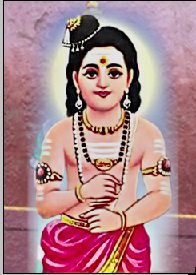 Here Thiru Jnana Sambandar, a small boy empowered with the divine milk proves He lived a – Pure Nirahari Life. The Shaiva scriptures tells us that Thiru Jnana Sambandar performed extraordinary feats in His life as the calling of His divine incarnate mission on the planet. He left His body in eternal youth through the sheer power of authentic ‘feeling connection’ to Lord Shiva– the very religion of Madurai Aadheenam, by merging into the infinite light of Shiva – ‘Shiva Periya Jyoti’. As a Nirahari, He had mastered His body to live on air, and was able to dissolve His body into light form. The Nithyananda Nirharis are also blessed to be endowed with the Divine Milk of the Cosmic Mother, in the form of Master’s physical presence, and His constant spiritual umbilical cord with His Niraharis through the practice of Prana Samayama, and satsangs. For Nithyanada Niraharis and devotees all over the planet, the Master Himself is the one embodiment of all Divine Energies, Masters, Incarnations in physical form. He is not only reviving these sacred spiritual sciences, but also constantly upgrading them in His great spiritual mystery schools – the Ashrams, and extended spiritual communities worldwide. 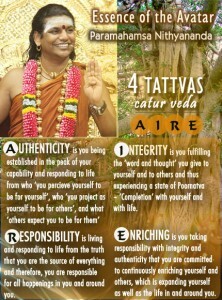 Paramahamsa Nithyananda is a Living Incarnation. Whenever a person lands on the planet earth, way ahead of his time, he is called Incarnation. Swamiji, as lovingly called by devotees, as an Avatar is already beyond all patterns. He travelled the length and breath of India, Nepal, and Tibet in his early youth to practice the deep spiritual, mystical sciences, as a Parivrajika, a spiritual wandering monk, surrendered to the Truths that everything is God. During his wanderings, he lived without food for days to even months, with often least visibility to human faces or dwellings. In his biographical happenings, He often speaks about coming to the nearest village for only taking salt. Barefoot, with 2 pieces of ochre robe, a water pot, not knowing where His next meal or drink would come from, except the passing rivers and streams, the Master is a perfect Nirahari, a Yogi who is served by all extraodrinary powers, and the capacity to transmit them to others, like a light transmission. Growing up in the temple town of Tiruvannamalai, the first Nirahari He encountered was Narayana Swami, a follower of Ayya Vaikuntapathi from Kanyakumari area, South. Narayana Swami was living on Divine mountain, Mt. Arunachala, hilltop in Tiurvannamalai, the very manifestation of Lord Shiva. For the young Avatar, in his own words “It was a great experience!” .